Cruise ships dock close to the center of town. (1.5km). Larger ships often tender their passengers to town. In 2015 the cruise quay was extended so larger cruise ships up to 375 meters will be able to dock. Free shuttle bus to the town. It is about an 30 minute walk. Although much nearer to Sweden, the island of Bornholm has been a Danish possession since 1522 and was once an important Baltic trading port. Today, the islanders make their livelihood from fishing, farming and, increasingly, tourism. Visitors from Scandinavia and Germany flock to Bornholm and the town of Rønne each summer to enjoy the scenic beauty. You'll find Rønne has a certain charm as you walk its historic Gamle Stan (Old Town), with its cobblestoned streets flanked by cross-timbered houses, many of them brightly painted in such "sunshine colors" as yellow and orange. The best streets for seeing Bornholm as it used to be are Laksegade and Storegade, plus the triangular sector lying between Store Torv and Lille Torv. You'll find even more charm in many of the island's smaller towns or hamlets. The post-office building (1900), the Citadel (1650) and Ronne Teater (1823) - the oldest theatre in the provinces. You should also visit The Bornholm Museum, The Defence Museum (Forsvarsmuseet) and The Museum of Ceramics (Hjorts Fabrik). Bornholm's 'Velkomstcenter' (tourist office) is at Nordre Kystvej 3. Ronne runs a shuttle from cruise ship dock to the Welcome Center up near where the ferries come in. It starts running at 8:50 and runs every 20 minutes. Europcar is right next to the Welcome Center. 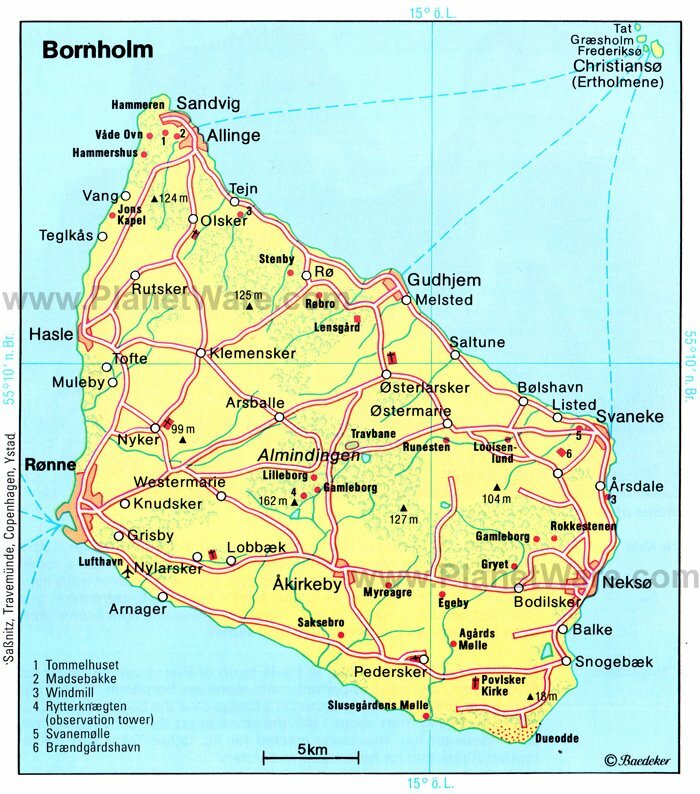 Bornholm is a great place for both leisure and active tourism. Lately, especially the latter kind has become very popular and fashionable. Bornholm is prepared for that. It offers its guests bowling and fitness centers, tennis courts, golf courses, hiking paths, indoor and outdoor swimming pools and of course biking routes. Bornholm is especially treasured for its dramatic cliffs and those beaches, the best of which are to be found at its northern and southern tips. Bicycle hire ranges from about 50kr to 75kr per day for three-speed bicycles. From May to September, bus 7 leaves from the Rønne ferry terminal every two hours between 10 am and 4pm and travels anticlockwise around the island, stopping at Dueodde beach and all major coastal villages before terminating at Hammershus. The circuit takes two hours and 40 minutes. Most of the island's shops line the streets funneling into the Lille Torv and the Store Torv. The island is known for its unique Bornholmer grandfather clocks. The tradition began in 1744 when a Dutch ship was stranded on the way from Helsingør in Denmark to Tallinn in Estonia. In its hold were five clocks and a cask with weights for them. Dexterous young men made models of the clocks and, in so doing, founded a Bornholm clock making tradition, a craft that virtually disappeared at the end of World War II. The craft has now been revived, and the island's largest clock maker workshop is located in Rønne. The daily shopping hours are 9:00am – 5:00pm. On Saturdays, most shops are open only from 9:00 a.m. to 12:00 p.m.
Danish, english is widely spoken. In Ronne there are internet terminals at the tourist info center. Also free wifi in and outside the building. Some shops in tourist areas stay open beyond the normal opening hours, particularly during the summer season. Shops are allowed to open on the first Sunday of every month, as well as on all Sundays in December, preceding Christmas Eve. However, if the first Sunday in a month falls on a holiday or on Constitution Day, shops will stay closed. Please note that ordinary shops are closed on public holidays including Constitution Day, 5 June, and Christmas Eve, December 24. Kiosks, bakeries, station shops etc. are usually open on Saturdays after 5 p.m. and Sundays.